6. They think I’m weird and creepy. See, the other offices in this building are being used as offices. Make your phone calls, file your stuff, meet with clients, interact, present yourself to the business world. There’s a tendency for offices to be decorated with impressing the incoming client in mind, and doors (which are mostly glass) are habitually left open to the hallway. Business clothing is the norm — casual, but professional. My office functions more as a studio. 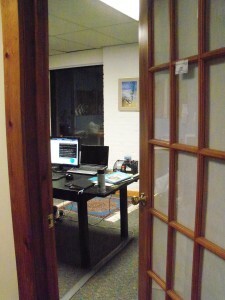 My desk is a big table, and it faces the windows with my back to the door, so I can look out while musing. I’ve got whiteboard-type dry-erase wallpaper on one wall with maps and notes and arrows drawn all over. Not only do I keep my door closed, I’ve put white paper over all the glass, so people walking by don’t see what’s on my immense computer monitor. Not exactly an “office” office. I arrive in jeans and change to yoga pants. I come at the end of the day, and stay who-knows-how-long. I wear little, if any, makeup. I have an inexplicable haircut. No one here knows I was treated for cancer last year, so the fact that when they first met me I was just this side of bald, probably had an effect. Without judging them negatively, I do have to say they are deeply of the Mundane world (as we SFF fans call it). People who don’t fit their expectations probably give them pause… I suspect that I just don’t make sense to them. The one exception: The free-lance computer programmer in one of the littlest rooms. Despite the fact that he’s in his twenties, cute as a bug, dresses modern-professional-metro cool — a sort of mutual recognition passed between us. We say hi, chat occasionally. He’s a nerd, I’m a nerd. We get it.